This article is about the mineral. Diamond is the hardest known natural material and the third-hardest known material after aggregated diamond nanorods and ultrahard fullerite. Its hardness and high dispersion of light make it useful for industrial applications and jewelry. Diamonds are specifically renowned as a material with superlative physical qualities—they make excellent abrasives because they can be scratched only by other diamonds, Borazon, ultrahard fullerite, or aggregated diamond nanorods. This also means that they hold a polish extremely well and retain their luster. The name diamond derives from the ancient Greek adamas (αδάμας), meaning "invincible." Diamonds have been treasured as gemstones since their use as religious icons in ancient India. Their usage in engraving tools also dates to early human history. The popularity of diamonds has risen since the nineteenth century because of increased supply, improved cutting and polishing techniques, growth in the world economy, and innovative and successful advertising campaigns. They are commonly judged by the “four Cs”: carat, clarity, color, and cut. Diamond crystals are formed deep within the Earth, under conditions of high pressure and high temperature. They are then brought to the surface in kimberlite and lamproite volcanic pipes, from which they are mined. Roughly 49 percent of diamonds originate from central and southern Africa, although significant sources of the mineral have been discovered in Canada, India, Russia, Brazil, and Australia. The attractiveness and high prices of natural diamonds have also brought out the darker of human nature, such as theft, violence, and the sale of conflict diamonds by African paramilitary groups. The conditions for diamond formation to happen in the lithospheric mantle occur at considerable depth corresponding to the aforementioned requirements of temperature and pressure. 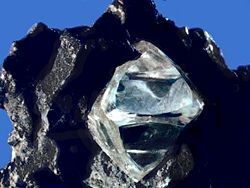 These depths are estimated to be in between 90–120 miles (140–190 kilometers) though occasionally diamonds have crystallized at depths of 300-400 km as well. The rate at which temperature changes with increasing depth into the Earth varies greatly in different parts of the Earth. In particular, under oceanic plates the temperature rises more quickly with depth, beyond the range required for diamond formation at the depth required. The correct combination of temperature and pressure is only found in the thick, ancient, and stable parts of continental plates where regions of lithosphere known as cratons exist. Long residence in the cratonic lithosphere allows diamond crystals to grow larger. Diamonds can also form in other natural high-pressure, relatively low-temperature events. Very small diamonds, known as microdiamonds or nanodiamonds, have been found in impact craters where meteors strike the Earth and create shock zones of high pressure and temperature where diamond formation can occur. Microdiamonds are now used as one indicator of ancient meteorite impact sites. The magma in volcanic pipes is usually one of two characteristic types, which cool into igneous rock known as either kimberlite or lamproite. 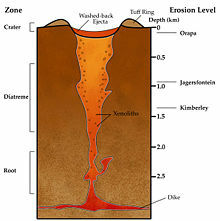 The magma itself does not contain diamond; instead, it acts as an elevator that carries deep-formed rocks (xenoliths), minerals (xenocrysts), and fluids upward. These rocks are characteristically rich in magnesium-bearing olivine, pyroxene, and amphibole minerals which are often altered to serpentine by heat and fluids during and after eruption. Certain indicator minerals typically occur within diamondiferous kimberlites and are used as mineralogic tracers by prospectors, who follow the indicator trail back to the volcanic pipe which may contain diamonds. These minerals are rich in chromium (Cr) or titanium (Ti), elements which impart bright colors to the minerals. The most common indicator minerals are chromian garnets (usually bright red Cr-pyrope, and occasionally green ugrandite-series garnets), eclogitic garnets, orange Ti-pyrope, red high-Cr spinels, dark chromite, bright green Cr-diopside, glassy green olivine, black picroilmenite, and magnetite. Kimberlite deposits are known as blue ground for the deeper serpentinized part of the deposits, or as yellow ground for the near surface smectite clay and carbonate weathered and oxidized portion. Diamonds can also be brought to the surface through certain processes which may occur when two continental plates collide and deeply formed rock is thrust to the surface, although this phenomenon is less understood and currently assumed to be uncommon. A diamond is a transparent crystal of tetrahedrally bonded carbon atoms and crystallizes into the face centered cubic diamond lattice structure. Diamonds have been adapted for many uses because of the material's exceptional physical characteristics. Most notable are its extreme hardness, its high dispersion index, and extremely high thermal conductivity (900 – 2320 W/m K), with a melting point of 3820 K (3547 °C / 6420 °F) and a boiling point of 5100 K (4827 °C / 8720 °F). Naturally occurring diamond has a density ranging from 3.15 to 3.53 g/cm³, with very pure diamond typically extremely close to 3.52 g/cm³. Diamond is the hardest natural material known to man - its hardness set to 10 (hardest) on Mohs scale of mineral hardness and having an absolute hardness value of between 90, 167, and 231 gigapascals in various tests. Diamond's hardness has been known since antiquity, and is the source of its name. However, aggregated diamond nanorods, an allotrope of carbon synthesized by compressing fullerene, are even harder than diamond. The hardness of diamonds contributes to its suitability as a gemstone. Because it can only be scratched by other diamonds, it maintains its polish extremely well, keeping its luster over long periods of time. Unlike many other gems, it is well-suited to daily wear because of its resistance to scratching—perhaps contributing to its popularity as the preferred gem in an engagement ring or wedding ring, which are often worn every day. Industrial use of diamonds has historically been associated with their hardness; this property makes diamond the ideal material for cutting and grinding tools. As the hardest known naturally occurring material, diamond can be used to polish, cut, or wear away any material, including other diamonds. However, diamond is a poor choice for machining ferrous alloys at high speeds. At the high temperatures created by high speed machining, carbon is soluble in iron, leading to greatly increased wear on diamond tools as compared to other alternatives. Common industrial adaptations of this ability include diamond-tipped drill bits and saws, or use of diamond powder as an abrasive. Industrial-grade diamonds are either unsuitable for use as gems or synthetically produced, which lowers their value and makes their use economically feasible. Industrial applications, especially as drill bits and engraving tools, also date to ancient times. Other specialized applications also exist or are being developed, including use as semiconductors: some blue diamonds are natural semiconductors, in contrast to most other diamonds, which are excellent electrical insulators. Diamonds can occur in nearly any color, though yellow and brown are by far the most common. "Black" diamonds are not truly black, but rather contain numerous dark inclusions that give the gems their dark appearance. When the color is saturated enough in yellow or brown diamonds, a stone may be referred to as a fancy colored diamond by the gem trade, otherwise they are graded for color in the normal color range of white diamonds. Colored diamonds contain impurities or structural defects that cause the coloration, while pure or nearly pure diamonds are transparent and colorless. Most diamond impurities replace a carbon atom in the crystal lattice, known as a carbon flaw. The most common impurity, nitrogen, causes a slight to intense yellow coloration depending upon the type and concentration of nitrogen present. The Gemological Institute of America (GIA) classifies low saturation yellow and brown diamonds as diamonds in the normal color range, and applies a grading scale from 'D' (colorless) to 'Z' (light yellow). The GIA labels diamonds that have more color than a 'Z' diamond "fancy," along with those that are any color other than yellow or brown. Diamonds can be identified via their high thermal conductivity. Their high refractive index is also indicative, but other materials have similar refractivity. Diamonds do cut glass, but other materials above glass on Mohs scale such as quartz do also. Diamonds easily scratch other diamonds, but this damages both diamonds. The most familiar usage of diamonds today is as gemstones used for adornment. This usage dates back into antiquity and predates other uses. The dispersion of white light into spectral colors, is the primary gemological characteristic of gem diamonds. In the twentieth century, experts in the field of gemology have developed methods of grading diamonds and other gemstones based on the characteristics most important to their value as a gem. Four characteristics, known informally as the four Cs, are now commonly used as the basic descriptors of diamonds: these are carat, cut, color, and clarity. Other characteristics not described by the four Cs influence the value or appearance of a gem diamond. These characteristics include physical characteristics such as the presence of fluorescence, as well as data on a diamond's history including its source and which gemological institute performed evaluation services on the diamond. Cleanliness also dramatically affects a diamond's beauty. There are three major non-profit gemological associations which grade and provide reports on diamonds. While carat weight and cut angles are mathematically defined, the clarity and color are judged by the trained human eye and are therefore open to slight variance in interpretation. American Gemological Society (AGS) is not as widely recognized nor as old as the GIA but garners a high reputation. The AGS employs a number system for grading cut quality, color grade, and clarity. The highest grade being '0', and the lowest being '10'. The price per carat does not increase smoothly with increasing size. Instead, there are sharp jumps around milestone carat weights, as demand is much higher for diamonds weighing just more than a milestone than for those weighing just less. As an example, a 0.95 carat diamond may have a significantly lower price per carat than a comparable 1.05 carat diamond, because of differences in demand. Diamonds become increasingly rare when considering higher clarity gradings. Only about 20 percent of all diamonds mined have a clarity rating high enough for the diamond to be considered appropriate for use as a gemstone; the other 80 percent are relegated to industrial use. Of that top 20 percent, a significant portion contains one or more visible inclusions. Those that do not have a visible inclusion are known as "eye-clean" and are preferred by most buyers, although visible inclusions can sometimes be hidden under the setting in a piece of jewelry. A chemically pure and structurally perfect diamond is perfectly transparent with no hue, or color. However, in reality almost no gem-sized natural diamonds are absolutely perfect. The color of a diamond may be affected by chemical impurities and/or structural defects in the crystal lattice. Depending on the hue and intensity of a diamond's coloration, a diamond's color can either detract from or enhance its value. For example, most white diamonds are discounted in price as more yellow hue is detectable, while intense pink or blue diamonds (such as the Hope Diamond) can be dramatically more valuable. The Aurora Diamond Collection displays a spectacular array of naturally colored diamonds. Most diamonds used as gemstones are basically transparent with little tint, or white diamonds. The most common impurity, nitrogen, replaces a small proportion of carbon atoms in a diamond's structure and causes a yellowish to brownish tint. This effect is present in almost all white diamonds; in only the rarest diamonds is the coloration from this effect undetectable. The GIA has developed a rating system for color in white diamonds, from "D" to "Z" (with D being "colorless" and Z having a bright yellow coloration), which has been widely adopted in the industry and is universally recognized, superseding several older systems once used in different countries. The GIA system uses a benchmark set of natural diamonds of known color grade, along with standardized and carefully controlled lighting conditions. Precision-crafted cubic zirconia master sets are sometimes used in the trade, however the GIA has found these sets to be inaccurate. Diamonds with higher color grades are rarer, in higher demand, and therefore more expensive, than lower color grades. Oddly enough, diamonds graded Z are also rare, and the bright yellow color is also highly valued. Diamonds graded D-F are considered "colorless," G-J are considered "near-colorless," K-M are "slightly colored." N-Y usually appear light yellow or brown. In contrast to yellow or brown hues, diamonds of other colors are more rare and valuable. While even a pale pink or blue hue may increase the value of a diamond, more intense coloration is usually considered more desirable and commands the highest prices. A variety of impurities and structural imperfections cause different colors in diamonds, including yellow, pink, blue, red, green, brown, and other hues. Diamonds with unusual or intense coloration are sometimes labeled "fancy" by the diamond industry. Intense yellow coloration is considered one of the fancy colors, and is separate from the color grades of white diamonds. Gemologists have developed rating systems for fancy colored diamonds, but they are not in common use because of the relative rarity of colored diamonds. Diamond cutting is the art and science of creating a gem-quality diamond out of mined rough. The cut of a diamond describes the manner in which a diamond has been shaped and polished from its beginning form as a rough stone to its final gem proportions. The cut of a diamond describes the quality of workmanship and the angles to which a diamond is cut. 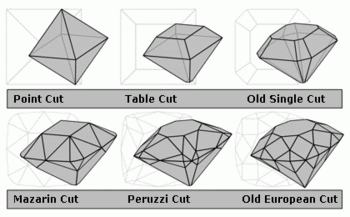 Often diamond cut is confused with "shape." The culet is the tiny point or facet at the bottom of the diamond. This should be a negligible diameter, otherwise light leaks out of the bottom. Tolkowsky's ideal dimensions did not include a culet. However, a thin culet is required in reality in order to prevent the diamond from easily chipping in the setting. A normal culet should be about 1–2 percent of the overall diameter. The further the diamond's characteristics are from Tolkowsky's ideal, the less light will be reflected. However, there is a small range in which the diamond can be considered "ideal." Today, because of the relative importance of carat weight in society, many diamonds are often intentionally cut poorly to increase carat weight. There is a financial premium for a diamond that weighs the magical 1.0 carat, so often the girdle is made thicker or the depth is increased. Neither of these tactics make the diamond appear any bigger, and they greatly reduce the sparkle of the diamond. So a poorly cut 1.0 carat diamond may have the same diameter and appear as large as a 0.85 carat diamond. The depth percentage is the overall quickest indication of the quality of the cut of a round brilliant. "Ideal" round brilliant diamonds should not have a depth percentage greater than 62.5%. Another quick indication is the overall diameter. Typically a round brilliant 1.0 carat diamond should have a diameter of about 6.5 mm. Mathematically, the diameter in millimeters of a round brilliant should approximately equal 6.5 times the cube root of carat weight, or 11.1 times the cube root of gram weight, or 1.4 times the cube root of point weight. Ideal cuts can be controversial as the definitions of brilliance and beauty are very subjective. Tolkowsky's mathematical model is now superseded by the GIA Facetware software that is the culmination of 20 years of studies on diamond cuts. New diamond cuts are now all the rage in the diamond industry as for example a design invented in 2003 and called the "Genesis cut." This cut differs in shape from the more traditional cuts in its concave surfaces and angles and resembles a 4-pointed star. 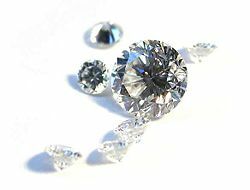 Diamonds which are not cut to the specifications of Tolkowsky's round brilliant shape (or subsequent variations) are known as "fancy cuts." Popular fancy cuts include the baguette (from the French, meaning rod or loaf of bread), marquise, princess cut (square outline), heart, briolette (a form of the rose cut), and pear cuts. Newer cuts that have been introduced into the jewelry industry are the "cushion" "radiant"(similar to princess cuts, but with rounded edges instead of square edges) and "Asscher" cuts. Many fancy colored diamonds are now being cut according to these new styles. Generally speaking, these "fancy cuts" are not held to the same strict standards as Tolkowsky-derived round brilliants and there are less specific mathematical guidelines of angles which determine a well-cut stone. Cuts are influenced heavily by fashion: the baguette cut—which accentuates a diamond's luster and downplays its fire—was all the rage during the Art Deco period, whereas the princess cut cut—which accentuates a diamond's fire rather than its luster—is currently gaining popularity. The princess cut is also popular amongst diamond cutters: of all the cuts, it wastes the least of the original crystal. The past decades have seen the development of new diamond cuts, often based on a modification of an existing cut. Some of these include extra facets. These newly developed cuts are viewed by many as more of an attempt at brand differentiation by diamond sellers, than actual improvements to the state of the art. In addition to carrying the most importance to a diamond's quality as a gemstone, the cut is also the most difficult to quantitatively judge. A number of factors, including proportion, polish, symmetry, and the relative angles of various facets, are determined by the quality of the cut and can affect the performance of a diamond. A poorly cut diamond with facets cut only a few degrees out of alignment can result in a poorly performing stone. For a round brilliant cut, there is a balance between "brilliance" and "fire." When a diamond is cut for too much "fire," it looks like a cubic zirconia, which gives off much more "fire" than real diamond. A well-executed round brilliant cut should reflect light upwards and make the diamond appear white when viewed from the top. An inferior cut will produce a stone that appears dark at the center and in some extreme cases the ring settings may show through the top of the diamond as shadows. Several different theories on the "ideal" proportions of a diamond have been and continue to be advocated by various owners of patents on machines to view how well a diamond is cut. These advocate a shift away from grading cut by the use of various angles and proportions toward measuring the performance of a cut stone. A number of specially modified viewers and machines have been developed toward this end. Hearts and Arrows viewers test for the "hearts and arrows" characteristic pattern observable in stones exhibiting high symmetry and particular cut angles. Closely related to Hearts and Arrows viewers is the ASET which tests for light leakage, light return, and proportions. The ASET (and computer simulations of the ASET) are used to test for AGS cut grade. These viewers and machines often help sellers demonstrate the light performance results of the diamond in addition to the traditional 4 Cs. Detractors see these machines as marketing tools rather than as scientific tools. The GIA has developed a set of criteria for grading the cut of round brilliant stones that is now the standard in the diamond industry and is called "Facetware." 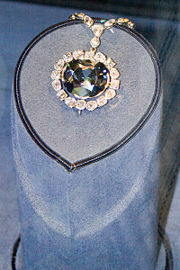 The famous 253-carat Oppenheimer Diamond Crystal, at a 2001 diamond exhibition in Paris. 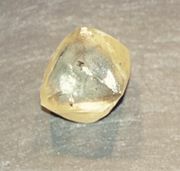 An uncut diamond does not show its prized optical properties. The process of shaping a rough diamond into a polished gemstone is both an art and a science. The choice of cut is often decided by the original shape of the rough stone, location of the inclusions and flaws to be eliminated, the preservation of the weight, popularity of certain shapes amongst consumers and many other considerations. The round brilliant cut is preferred when the crystal is an octahedron, as often two stones may be cut from one such crystal. Oddly shaped crystals are more likely to be cut in a fancy cut—that is, a cut other than the round brilliant—which the particular crystal shape lends itself to. Even with modern techniques, the cutting and polishing of a diamond crystal always results in a dramatic loss of weight; rarely is it less than 50 percent. Sometimes the cutters compromise and accept lesser proportions and symmetry in order to avoid inclusions or to preserve the carat rating. Since the per carat price of diamond shifts around key milestones (such as 1.00 carat), many one-carat diamonds are the result of compromising "Cut" for "Carat." Some jewelry experts advise consumers to buy a 0.99 carat diamond for its better price or buy a 1.10 carat diamond for its better cut, avoiding a 1.00 carat diamond which is more likely to be a poorly cut stone. In the gem trade, the term light performance is used to describe how well a polished diamond will return light to the viewer. There are three light properties which are described in relation to light performance; brilliance, fire, and scintillation. Brilliance refers to the white light reflections from the external and internal facet surfaces. Fire refers to the spectral colors which are produced as a result of the diamond dispersing the white light. Scintillation refers to the small flashes of light that are seen when the diamond, light source or the viewer is moved. A diamond that is cut and polished to produce a high level of these qualities is said to be high in light performance. The setting diamonds are placed in also affect the performance of light through a diamond. The three most commonly used settings are: Prong, Bezel, and Channel. Prong settings are the most popular setting for diamond jewelry. The prong setting consists of four or six 'claws' that cradle the diamond, allowing the maximum amount of light to enter from all angles, allowing the diamonds to appear larger and more brilliant. In bezel settings the diamond or gemstone is completely surrounded by a rim of metal, which can be molded into any shape to accommodate the stone. Used to set earrings, necklaces, bracelets, and rings, bezel settings can have open or closed backs, and generally can be molded to allow a lot of light to pass through. Channel settings set the stones right next to each other with no metal separating them. This setting is mostly used in wedding and anniversary bands. The outer ridge is then worked over the edges of the stones to create a smooth exterior surface. This also protects the girdle area of the stone. About a third of all diamonds will glow under ultraviolet light, usually a blue color which may be noticeable under a black light or strong sunlight. According to the GIA, who reviewed a random sample of 26,010 natural diamonds, 65 percent of the diamonds in the sample had no fluorescence. Of the 35 percent that did have fluorescence, 97 percent had blue fluorescence of which 38 percent had faint blue fluorescence and 62 percent had fluorescence that ranged from medium to very strong blue. Other colors diamonds can fluoresce are green, yellow, and red but are very rare and are sometimes a combination of the colors such as blue-green or orange. Some diamonds with "very strong" fluorescence can have a "milky" or "oily" look to them, but they are also very rare and are termed "overblues." Their study concluded that with the exception of "overblues" and yellow fluorescent diamonds, fluorescence had little effect on transparency and that the strong and very strong blue fluorescent diamonds on average had better color appearance than non-fluorescent stones. Since blue is a complementary color to yellow and can appear to cancel it out, strong blue fluorescence had especially better color appearance with lower color graded diamonds that have a slight yellowish tint such as "I" color or "J" color but had little effect on the more colorless "D" through "F" color grades. Cleanliness heavily affects a diamond's beauty. A clean diamond is more brilliant and fiery than the same diamond when it is "dirty." Dirt or grease on the top of a diamond reduces its luster. Water, dirt, or grease on the bottom of a diamond interferes with the diamond's brilliance and fire. Even a thin film absorbs some light that could have been reflected to the person looking at the diamond. Colored dye or smudges can affect the perceived color of a diamond. Historically, some jewelers' stones were misgraded because of smudges on the girdle, or dye on the culet. Current practice is to clean a diamond thoroughly before grading its color. Maintaining a clean diamond can sometimes be difficult as jewelry settings can obstruct cleaning efforts and oils, grease, and other hydrophobic materials adhere well to a diamond's surface. Many jewelers use steam cleaners. Some jewelers provide their customers with ammonia-based cleaning kits; ultrasonic cleaners are also popular. Diamonds are thought to have been first recognized and mined in India (Golconda being one of them), where significant alluvial deposits of the stone could then be found along the rivers Penner, Krishna and Godavari. Diamonds have been known in India for at least 3000 years but most likely 6000 years. The earliest written reference can be found in the Buddhist text, the Anguttara Nikaya another Sanskrit text, the Arthashastra, which was completed around 296 B.C.E. and describes diamond's hardness, luster, and dispersion. Diamonds quickly became associated with divinity, being used to decorate religious icons, and were believed to bring good fortune to those who carried them. Ownership was restricted among various castes by color, with only kings being allowed to own all colors of diamond. In February 2005, a joint Chinese-U.S. team of archaeologists reported the discovery of four corundum-rich stone ceremonial burial axes originating from China's Liangzhu and Sanxingcun cultures (4000 B.C.E.–2500 B.C.E.) which, because of the axes' specular surfaces, the scientists believe were polished using diamond powder. Although there are diamond deposits now known to exist close to the burial sites, no direct evidence of coeval diamond mining has been found: the researchers came to this conclusion by polishing corundum using various lapidary abrasives and modern techniques then comparing the results using an atomic force microscope. At that scale, the surface of the modern diamond-polished corundum closely resembled that of the axes; however, the polishes of the latter were superior. Diamonds were traded to both the east and west of India and were recognized by various cultures for their gemological or industrial uses. In his work Naturalis Historia, the Roman writer Pliny the Elder noted diamond's ornamental uses, as well as its usefulness to engravers because of its hardness. It is however highly doubtful that Pliny actually meant diamonds and it is assumed that in fact several different minerals such as Corundum, Spinel, or even a mixture with Magnetite were all referred to by the word "adamas." In China, diamonds seem to have been used primarily as diamond tools for engraving jade and drilling holes in beads. Archaeological evidence from Yemen suggests that diamonds were used as drill tips as early as the fourth century B.C.E. In Europe, however, diamonds disappeared for almost 1000 years following the rise of Christianity because of two effects: early Christians rejected diamonds because of their earlier use in amulets, and Arabic traders restricted the flow of trade between Europe and India. Until the late Middle Ages, diamonds were most prized in their natural octahedral state, perhaps with the crystal surfaces polished to increase luster and remove foreign material. 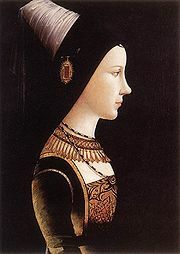 Around 1300, the flow of diamonds into Europe increased via Venice's trade network, with most flowing through the low country ports of Bruges, Antwerp, and Amsterdam. During this time, the taboo against cutting diamonds into gem shapes, which was established over 1000 years earlier in the traditions of India, ended allowing the development of diamond cutting technology to begin in earnest. By 1375, a guild of diamond polishers had been established at Nuremberg. Over the following centuries, various diamond cuts were introduced which increasingly demonstrated the fire and brilliance that makes diamonds treasured today: the table cut, the briolette (around 1476), the rose cut (mid-sixteenth century), and by the mid-seventeenth century, the Mazarin, the first brilliant cut diamond design. In 1919, Marcel Tolkowsky developed an ideal round brilliant cut design that has set the standard for comparison of modern gems; however, diamond cuts have continued to be refined. The rise in popularity of diamonds as gems seems to have paralleled increasing availability through European history. In the thirteenth century, King Louis IX of France established a law that only the king could own diamonds. However, within a century diamonds were popular gems among the moneyed aristocratic and merchant classes, and by 1477 had begun to be used rarely in wedding rings. Diamond wedding rings didn't gain widespread social significance until the De Beers company started marketing the idea through cinema beginning in the 1940s. A number of large diamonds have become historically significant objects, as their inclusion in various sets of crown jewels and the purchase, sale, and sometimes theft of notable diamonds, have sometimes become politicized. The Cullinan Diamond, part of the British crown jewels, was the largest gem-quality rough diamond ever found (1905), at 3,106.75 carats. One of the diamonds cut from it, Cullinan I or the Great Star of Africa, was formerly the largest gem-quality cut diamond at 530.2 carats, but now that title has been taken by the Golden Jubilee (1985), a 545.67 carat, yellow-brown diamond. The largest flawless and colorless (grade D) diamond is the Centenary Diamond which weighs 273.85 carats. The Millennium Star is the second largest (1990) at 203.04 carats. Travis Metcalfe, an astronomer at the Harvard-Smithsonian Center for Astrophysics, believes that the galaxy's largest diamond is the core of the white dwarf star BPM 37093. Observations indicate that the core is a diamond crystal 4000 km in diameter, with a corresponding weight of over 5 × 1026 carats. On August 28, 2007, a giant gem, 7,000 carats (2x the size of the Cullinan Diamond and about the size of a coconut, with a greenish tinge) was reported discovered by a small South African mining company. Still to be confirmed, Brett Jolly (shareholder at the mine), deposited the gem to a bank vault in Johannesburg. The company announced that it asked the president of the World Federation of Diamond Bourses to make the examination next week. De Beers however stated that "the north-west province was not known for producing gems and greenish stones were even rarer". A large trade in gem-grade diamonds exists. Unlike precious metals such as gold or platinum, gem diamonds do not trade as a commodity: there is a substantial mark-up in the sale of diamonds, and there is not a very active market for resale of diamonds. One hallmark of the trade in gem-quality diamonds is its remarkable concentration: wholesale trade and diamond cutting is limited to a few locations (most importantly Antwerp, London, New York, Tel Aviv, Amsterdam and Surat), and a single company—De Beers—controls a significant proportion of the trade in diamonds. They are based in Johannesburg, South Africa and London, England. The production and distribution of diamonds is largely consolidated in the hands of a few key players, and concentrated in traditional diamond trading centers. The most important being Antwerp, where 80% of all rough diamonds, 50% of all cut diamonds and more than 50% of all rough, cut and industrial diamonds combined are handled. This makes Antwerp the de facto 'world diamond capital'. New York, however, along with the rest of the United States, is where almost 80% of the world's diamonds are sold, including at auction. Also, the largest and most unusually shaped rough diamonds end up in New York. The De Beers company, as the world's largest diamond miner holds a clearly dominant position in the industry, and has done so since soon after its founding in 1888 by the British imperialist Cecil Rhodes. De Beers owns or controls a significant portion of the world's rough diamond production facilities (mines) and distribution channels for gem-quality diamonds. The company and its subsidiaries own mines that produce some 40 percent of annual world diamond production. At one time it was thought over 80 percent of the world's rough diamonds passed through the Diamond Trading Company (DTC, a subsidiary of De Beers) in London, but presently the figure is estimated at less than 50 percent. The De Beers diamond advertising campaign is acknowledged as one of the most successful and innovative campaigns in history. N.W. Ayer & Son, the advertising firm retained by De Beers in the mid-20th century, succeeded in reviving the American diamond market and opened up new markets, even in countries where no diamond tradition had existed before. N.W. Ayer's multifaceted marketing campaign included product placement, advertising the diamond itself rather than the De Beers brand, and building associations with celebrities and royalty. This coordinated campaign has lasted decades and continues today; it is perhaps best captured by the slogan "a diamond is forever." Further down the supply chain, members of The World Federation of Diamond Bourses (WFDB) act as a medium for wholesale diamond exchange, trading both polished and rough diamonds. The WFDB consists of independent diamond bourses in major cutting centers such as Tel Aviv, Antwerp, Johannesburg and other cities across the USA, Europe and Asia. The market for industrial-grade diamonds operates much differently from its gem-grade counterpart. Industrial diamonds are valued mostly for their hardness and heat conductivity, making many of the gemological characteristics of diamond, including clarity and color, mostly irrelevant. This helps explain why 80 percent of mined diamonds (equal to about 100 million carats or 20,000 kg annually), unsuitable for use as gemstones and known as bort, are destined for industrial use. In addition to mined diamonds, synthetic diamonds found industrial applications almost immediately after their invention in the 1950s. With the continuing advances being made in the production of synthetic diamonds, future applications are beginning to become feasible. Garnering much excitement is the possible use of diamond as a semiconductor suitable to build microchips from, or the use of diamond as a heat sink in electronics. Since the quality of the best synthetic diamonds is now equal to or better than that of the most perfect natural diamonds, significant changes in the gem-diamond industry may also be forthcoming. The diamond supply chain is controlled by a limited number of powerful businesses, and is also highly concentrated in a small number of locations around the world. In fact, the amount of power which De Beers has consolidated historically prevented it from direct trade with the United States, as its trade practices led to an indictment for violating antitrust regulations. The concentration of power only loosens at the retail level, where diamonds are sold by a limited number of distributors, known as sightholders, to jewelers around the world. Historically, diamonds were known to be found only in alluvial deposits in southern India. India led the world in diamond production from the time of their discovery in approximately the ninth century B.C.E. to the mid-eighteenth century C.E., but the commercial potential of these sources has been exhausted by the late eighteenth century and at that time eclipsed by Brazil, and later South Africa. The first non-Indian diamond source was found in Brazil in 1725. While no commercial diamond production exists in the U.S., Arkansas and Colorado are the only states to have a verifiable source of diamonds. Today, most commercially viable diamond deposits are in Russia, Botswana, Australia and the Democratic Republic of Congo. In 2005, Russia produced almost one-fifth of the global diamond output, reports the British Geological Survey. Australia boasts the richest diamondiferous pipe with production reaching peak levels of 42 Mct per year in the 1990s. There are also commercial deposits being actively mined in the Northwest Territories of Canada, Siberia (mostly in Yakutia territory, for example Mir pipe and Udachnaya pipe), Brazil, and in Northern and Western Australia. Diamond prospectors continue to search the globe for diamond-bearing kimberlite and lamproite pipes. 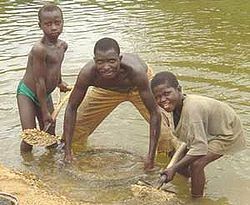 In some of the more politically unstable central African and west African countries, revolutionary groups have taken control of diamond mines, using proceeds from diamond sales to finance their operations. Diamonds sold through this process are known as conflict diamonds or blood diamonds. In response to public concerns that their diamond purchases were contributing to war and human rights abuses in central Africa and West Africa, the United Nations, the diamond industry and diamond-trading nations introduced the Kimberley Process in 2002, which is aimed at ensuring that conflict diamonds do not become intermixed with the diamonds not controlled by such rebel groups. The Kimberley Process provides documentation and certification of diamond exports from producing countries to ensure that the proceeds of sale are not being used to fund criminal or revolutionary activities. Although the Kimberley Process has been moderately successful in limiting the number of conflict diamonds entering the market, conflict diamonds smuggled to market continue to persist to some degree (approx. 2–3 percent of diamonds traded today are possible conflict diamonds). According to the 2006 book The Heartless Stone. two major flaws still hinder the effectiveness of the Kimberley Process: the relative ease of smuggling diamonds across African borders and giving phony histories, and the violent nature of diamond mining in nations which are not in a technical state of war and whose diamonds are therefore considered "clean." The Diamond Trading Company, or DTC, is a subsidiary of De Beers and markets rough diamonds produced both by De Beers mines and other mines from which it purchases rough diamond production. DTC performs sophisticated sorting of rough diamonds into categories, and then sells bulk lots of rough diamonds to a limited number of sightholders a few times a year. Once purchased by sightholders, diamonds are cut and polished in preparation for sale as gemstones. The cutting and polishing of rough diamonds is a specialized skill that is concentrated in a limited number of locations worldwide. Traditional diamond cutting centers are Antwerp, Amsterdam, Johannesburg, New York, and Tel Aviv. Traditionally, diamond cutters in these cities are Orthodox Jews or Chasidim. Recently, diamond cutting centers have been established in China, India, and Thailand. Cutting centers with lower costs of labor, notably Surat in Gujarat, India, handle a larger number of smaller carat diamonds, while smaller quantities of larger or more valuable diamonds are more likely to be handled in Europe or North America. The recent expansion of this industry in India, employing low cost labor, has allowed smaller diamonds to be prepared as gems than was previously economically feasible. Natural diamonds have formed naturally within the earth. Synthetic diamonds are created by a man-made process. A diamond simulant is defined as a non-diamond material that is used to simulate the appearance of a diamond. A diamond's gem quality, which is not as dependent on material properties as industrial applications, has invited both imitation and the invention of procedures to enhance the gemological properties of natural diamonds. Materials which have similar gemological characteristics to diamond but are not mined or synthetic diamond are known as diamond simulants. The most familiar diamond simulant to most consumers is cubic zirconia (commonly abbreviated as CZ); recently moissanite has also gained popularity and has often been mischaracterized as a diamond simulant, although it is sold and retailed as a replacement for diamond. Both CZ and moissanite are synthetically produced. However, CZ is a diamond simulant. Diamond enhancements are specific treatments, performed on natural diamonds (usually those already cut and polished into a gem), which are designed to better the gemological characteristics of the stone in one or more ways. These include laser drilling to remove inclusions, application of sealants to fill cracks, treatments to improve a white diamond's color grade, and treatments to give fancy color to a white diamond. Currently, trained gemologists with appropriate equipment are able to distinguish natural diamonds from simulant diamonds, and they can identify all enhanced natural diamonds. Coatings are more and more used to give a diamond simulant such as Cubic Zirconia a more "Diamond like" appearance. One such substance, which is heavily advertised, is what scientists refer to as "diamond-like carbon." This is an amorphous carbonaceous material that has some physical properties which are similar to that of the diamond. Advertising suggests (righfully so or not) that such a coating would transfer some of these diamond-like properties to the coated stone, hence enhancing the diamond simulant. However modern techniques such as Raman Spectroscopy should easily identify such as treatment. A diamond gives victory to him who carries it bound on his left arm, no matter the number of enemies. The oldest dated printed book in the world is called the Diamond Sutra, dates from 868 C.E. and was found in a cave in North-West China. Sutra's are most used to describe the teachings of Buddha. In this case the title of the Sutra refers not to the diamond itself but to a 'diamond blade that will cut through worldly illusion to illuminate what is real and everlasting'. Jewel imaginary forms a central part of Buddhism: the triple-jewel represent 'Buddha', his teachings Dharma and the spiritual community Shangha. The book presently resides in the British Library. The origin of our custom to use diamonds in rings, and more recently, in engagement rings, can be traced back to the Middle Ages and even the Romans. The Romans valued the diamond entirely on account of its supernatural powers. Pliny wrote that a diamond baffles poison, keeps off insanity and dispels vain fears. The medieval Italians copied these beliefs and added some to it: they called it the "Pietra della Reconciliazone" because it maintained concord between husband and wife. On this account it was recommended as the stone to be set in wedding (or espousal) rings—not on account of its beauty therefore, which was described by Isidore of Seville as a small stone devoid of beauty. The diamond is the birthstone for people born in the month of April, and is also used as the symbol of a 60-year anniversary, such as a Diamond Jubilee (see hierarchy of precious substances). In a system of heraldry by gemstones occasionally used in the past for the arms of nobles, diamond was used to represent the color sable, or black. Diamonds are a common focus of fiction. Notable pieces of fiction include Ian Fleming's Diamonds Are Forever (1956), Arthur C. Clarke's 2061: Odyssey Three (1988), F. Scott Fitzgerald's "The Diamond as Big As the Ritz" (1922), and Neal Stephenson's The Diamond Age (1995). In addition, diamonds are the subject of various myths and legends. ↑ Pliny the Elder. 1991. Natural History: A Selection. (New York, NY: Penguin Classics. ISBN 0140444130). ↑ 3.0 3.1 Chinese made first use of diamond. BBC News. Retrieved September 3, 2007. ↑ 4.0 4.1 4.2 4.3 4.4 Gemological Institute of America. 2002.Diamonds and Diamond Grading: Lesson 4 How Diamonds Form. Carlsbad, CA: Gemological Institute of America. ↑ 5.00 5.01 5.02 5.03 5.04 5.05 5.06 5.07 5.08 5.09 5.10 5.11 American Museum of Natural History. The Nature of Diamonds. Retrieved September 3, 2007. ↑ Robert Webster and Peter G. Read, (Ed.) 2000. Gems: Their sources, descriptions and identification. (Burlington, MA: Butterworth-Heinemann. ISBN 0750616741). ↑ Carbon Melting and Boiling Points. Retrieved September 3, 2007. ↑ What are Aggregated Diamond Nanorods?. WiseGeek. Retrieved November 17, 2014. ↑ W.R. Taylor, A.J. Lynton & M. Ridd. 1990. Nitrogen defect aggregation of some Australasian diamonds: Time-temperature constraints on the source regions of pipe and alluvial diamonds. American Mineralogist. 75:1290–1310. Retrieved September 4, 2007. ↑ J.E. Field, 1981. Strength and Fracture Properties of Diamond. Philosophical Magazine A 43(3):595–618. ↑ Robert Krampf. 2006. Is That a Diamond? Retrieved September 4, 2007. ↑ GIA History. GIA. Retrieved September 4, 2007. ↑ Antwerp World Diamond Center Retrieved November 18, 2014. ↑ Rapaport Diamond Report. Retrieved September 4, 2007. ↑ A Contribution to the Understanding of Blue Fluorescence on the Appearance of Diamonds. GIA. Retrieved September 4, 2007. ↑ 17.0 17.1 17.2 17.3 Willard M.S. Hershey. 1940. The Book of Diamonds. (New York, NY: Hearthside Press). ↑ Earliest use of diamonds by Chinese found. China Daily. Retrieved September 4, 2007. ↑ In fact Pliny in Book XXXVII, xv, 61 mentioned Germany as the best location of Diamonds. E. Caley and J. Richards also discuss Pliny's referral in Book XXXVI, 54 of the stone of "Naxos" as being adamas, and which had long been used for cutting and polishing. A chief product of Naxos has long been a high grade of amorphous corundum which was used as an abrasive. ("Theophrastus, On Stones," E. Caley, J. Richards, (Ohio State University, 1956), 91). They further discuss his referral to the adamas coming from the "East" through Armenian traders but they show this was actually based on an erroneous interpretation of Theophrastus. Gardner F. Williams. Diamond Mines of South Africa. (New York: BF Buck Company, 1905) argues that the stone named "adamas" by the Greek and further referred to by Pliny was most likely a sapphire since this was a much more abundant stone, even amongst traders in Asia, than diamond (especially when used in the context of "adamas" being an ornamental stone and not used in an "industrial" context of engraving gems). Streeter makes a similar argument in his book (Edwin Streeter. Precious Stones and gems. (London: Bell and Sons, 1898). There seems to be a consensus over a large period of time that in fact the "adamas" was not a diamond, but mostly any type of Corundum, several other minerals such as Spinel were probably confused with diamonds as well; particularly because of a similarity in hardness and their availability in the Mediterranean area. (see discussion in Theophrastus). ↑ Whitehouse, David. 2004. Diamond star thrills astronomers. BBC. Retrieved September 4, 2007. ↑ BBC NEWS, 'Massive' gem dug up in S Africa. BBC. Retrieved September 4, 2007. ↑ Fresh tests for 'giant diamond'. BBC. Retrieved September 4, 2007. ↑ W.R. Catelle. 1911. The Diamond. (London; New York: John Lane Company.) Discussion on Alluvial diamonds in India and elsewhere as well as earliest finds. ↑ V. Ball. 1881. Diamonds, Gold and Coal of India. (London, UK: Truebner & Co.) Ball was a Geologist in British service. ↑ Stephen Marshall and Josh Shore. 2004. The Diamond Life. Retrieved September 4, 2007. ↑ Joint Resolution - World Federation of Diamond Bourses (WFDB) and International Diamond Manufacturers Association. World Diamond Council. Retrieved September 4, 2007. ↑ Zoellner, Tom. 2006. The Heartless Stone: A Journey Through the World of Diamonds, Deceit, and Desire. New York, NY: St. Martin's Press. ISBN 0312339690. ↑ Bourse listing. World Federation of Diamond Bourses. Retrieved September 4, 2007. ↑ The Nature of Diamonds: 5. Growing Diamonds. American Museum of Natural History. Retrieved September 4, 2007. ↑ J.E. Shigley, et al. 2002. Gemesis Laboratory Created Diamonds. Gems and Gemology 38(4):301–309. ↑ J.E. Shigley et al. 2004. Lab Grown Colored Diamonds from Chatham Created Gems. Gems and Gemology 40(2):128-145. ↑ Michael O'Donoghue. 2006. Gems. (St. Louis, MO: Elsevier. ISBN 0750658568). ↑ SSEF Swiss Gemmological Institute. Retrieved September 4, 2007. ↑ Christopher Welbourn, 2006. Identification of Synthetic Diamonds: Present Status and Future Developments/Proceedings of the 4th International Gemological Symposium. Gems and Gemology 42(3):34-35. ↑ J.E. Shigley, 2007. Observations on new coated gemstones. Gemmologie: Zeitschrift der Deutschen Gemmologischen Gesellschaft 56(1/2):53-56. ↑ W.R. Catelle, 1911. The Diamond. (John Lane Company.) He describes Diamonds being worn as long as 5000 years ago, recorded in ancient Hindu writings. George Frederick Kunz. in "A Curious Lore of Precious Stones" describes how a diamond in ancient times is worn on the forehead until the early nineteenth century this was a tradition believed to bring good luck. Devotional statues is not specifically mentioned. ↑ Diamond Sutra. British Library. Retrieved September 4, 2007. ↑ E. J. Epstein, 1982. Have you ever tried to sell a diamond? The Atlantic. Retrieved September 4, 2007. ↑ Julian Franklyn. 1961. Shield and Crest. London, UK: MacGibbon & Kee. American Museum of Natural History. "The Nature of Diamonds". Retrieved September 5, 2007. Carnegie Institution. "Very Large Diamonds Produced Very Fast". Retrieved September 5, 2007. Catelle, W.R. The Diamond. London; New York: John Lane Company, 1911. David, Joshua. "The New Diamond Age". Wired, 2003. Retrieved September 5, 2007. "De Beers Group." De Beers opens two mines in Canada. debeersweb Retrieved September 5, 2007. Epstein, Edward Jay. "Have You Ever Tried To Sell a Diamond?" The Atlantic Monthly, 1982. Retrieved September 5, 2007. Epstein, Edward Jay. The Diamond Invention. Lancashire, UK: Arrow Publishing, 1982. ISBN 0091476909. Eppler, W.F. Praktische Gemmologie. Rühle-Diebner-Verlag, 1989. Evevn-Zohar, Chaim. "From Mine to Mistress - Corporate Strategies and Government Policies in the International Diamond Industry" (Second edition of the book on the world diamond industry) Mining Journal Press, 2007. Retrieved September 5, 2007. Franklyn, Julian. Shield and Crest. London, UK: MacGibbon & Kee, 1961. King, C.W. A Natural History of Precious Stones and Precious Metals. Cambridge Press, 1897. Kjarsgaard, B.A., and A.A. Levinson. Diamonds in Canada. Gems & Gemology 38(3) (2002): 208-238. Kunz, George Frederick. Curious Lore of Precious Stones. Philadelphia, PA: Lippincott Co., 1913. Kunz, George Frederick. Rings for the Finger. Philadelphia, PA: J.H. Lippincott Co., 1917. O'Donoghue, Michael. Gems. St. Louis, MO: Elsevier, 2006. ISBN 0750658568. Pagel-Theisen, Verena. Diamond Grading ABC: the Manual. Antwerp, Belgium: Rubin & Son, 2001. ISBN 3980043460. Streeter. The Great Diamonds of the World. London, UK: George Bell & Sons, 1882. Taylor, W.R., A.J. Lynton & M. Ridd. Nitrogen defect aggregation of some Australasian diamonds: Time-temperature constraints on the source regions of pipe and alluvial diamonds. American Mineralogist 75 (1990):1290–1310. Retrieved September 5, 2007. Tolkowsky, Marcel. Diamond Design: A Study of the Reflection and Refraction of Light in a Diamond. London, UK: E. & F.N. Spon, Ltd., 1919. Retrieved September 5, 2007. Tyson, Peter. "Diamonds in the Sky". Nova PBS.org, 2000. Retrieved September 5, 2007. Webster, Robert, and Peter G. Read, (eds.). Gems: Their sources, descriptions and identification. Burlington, MA: Butterworth-Heinemann, 2000. ISBN 0750616741. Weiner, K.L., R. Hochleitner, S. Weiss, H. Voelstadt. Diamant. München: Lapis,1994. Welbourn, Christopher. Identification of Synthetic Diamonds: Present Status and Future Developments. (Proceedings of the 4th International Gemological Symposium.) Gems and Gemology 42(3) (2006):34-35. Williams, Gardner. The Diamond Mines of South Africa. New York, NY: B.F Buck & Co., 1905. Yarnell, Amanda. "The Many Facets of Man-Made Diamonds". Chemical & Engineering News 82(5) (2004):26-31. Retrieved September 5, 2007. Zoellner, Tom. The Heartless Stone: A Journey Through the World of Diamonds, Deceit, and Desire. New York, NY: St. Martin's Press, 2006. ISBN 0312339690. This page was last modified on 24 October 2017, at 20:48.